Product prices and availability are accurate as of 2019-03-30 18:31:23 EDT and are subject to change. Any price and availability information displayed on http://www.amazon.com/ at the time of purchase will apply to the purchase of this product. The RIDGID Kwik-Spin Hand Spinner with AUTOFEED is a hand auger allowing a user to manually spin drum feeding the snake auger cable in and out of the drain. The 1/4-inch Inner Core cable and bulb auger break up the drain clog and get the system flowing. 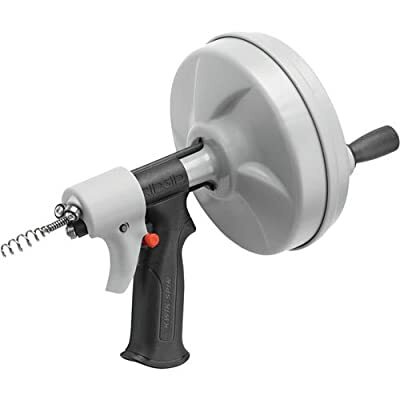 At only 3.9 pounds (1.8 Kg) this drain auger provides easy operation as the cable self-feeds down drain creating less mess without hands on the snake cable. Ideal for 1-1/2 inch lines making it perfect as a toilet auger or for cleaning clogged sink drains and backed up tubs.